The leaders of the three religious faiths and UNDA students representing the three religions, with Vice-Chancellor Professor Celia Hammond (far right). Photo: Amy Gibbs/UNDA. 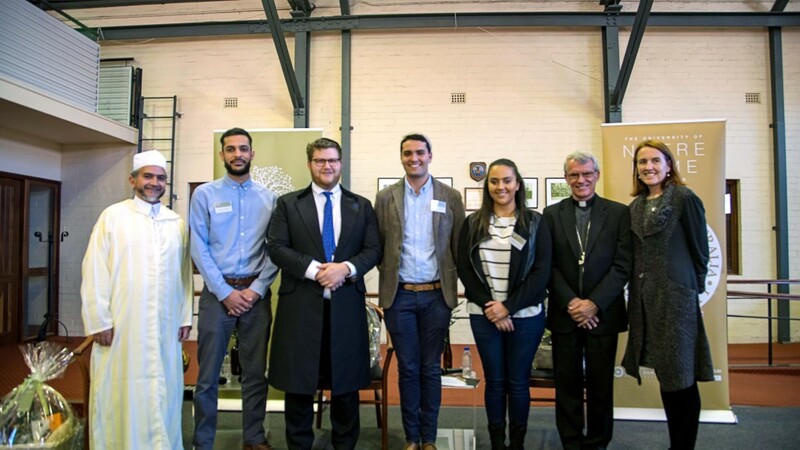 Held at the university’s Fremantle campus, the event brought together Archbishop of Perth Timothy Costelloe SDB, Chief Rabbi of WA Daniel Lieberman, and Teacher at Langford Islamic College Sheikh Muhammad Agherdien. 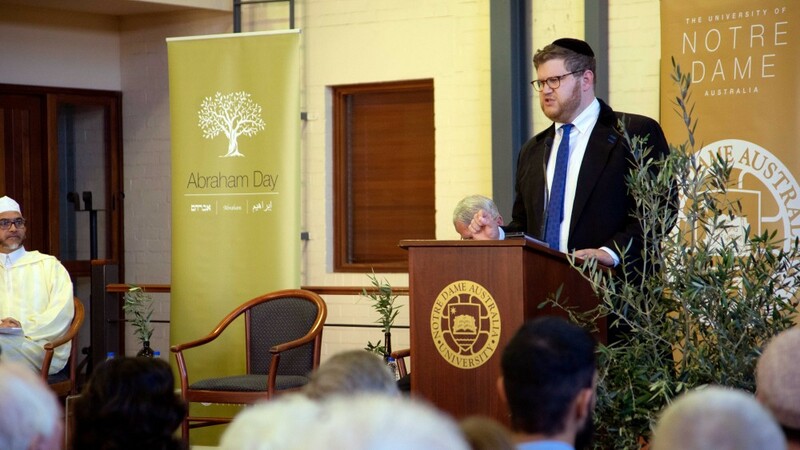 Opening the event, UNDA Vice-Chancellor Professor Celia Hammond told the audience that Abraham Day is “an opportunity for us all to come together, to celebrate our commonalities and shared beliefs in a spirit of openness, fraternity and hospitality”. Prof Hammond explained how statistical data has shown there is an increasing number of Australians who identify as having “no religion”. “In 1966, 0.8 per cent of the population identified as ‘no religion’. In 1991, it grew to 12.9 per cent. In 2011, it had grown to 22 per cent – and in 2016, 30 per cent of the population identified as ‘no religion’,” she said. “While those identified as Christians remains a majority of the Australian population at 52 per cent, the denomination of the largest number which is Catholic has fallen to 22 per cent; this is eight per cent lower than the no religious affiliation. Thus meaning no religion is the highest single category. “What the data doesn’t show, because it is not the purpose of the census, is why this happened. Nor did the statistics directly reveal the impact of this changing reality. “We have invited our faith leaders here today to find out from them what they think how people of faith, or more accurately people of religious faith engage with this reality,” she continued. 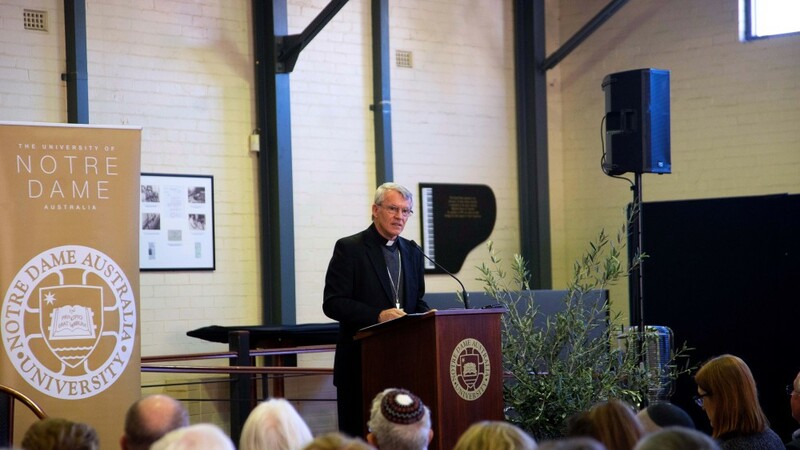 The Catholic Archbishop of Perth Timothy Costelloe, responding to the theme during Abraham Day on Wednesday 5 September. Photo: Amy Gibbs/UNDA. Archbishop Costelloe, as the leader of the Catholic Church in Perth and representative for Christian faith, began his answers to the question by going back to the Bible, emphasising that the Bible to be not only “a collection of ancient writings” but regarded as the Word of God, quoting the verse in Psalm 119. “Because the Catholic Church regards the Bible as the Word of God in the words of human beings – these words come from the documents of the Second Vatican Council. The work of interpretation, and sometimes the need for an authoritative interpretation, is an essential part of our Catholic approach,” the Perth Archbishop said. Archbishop Costelloe elaborated that central to the Catholic and the whole Christian approach to life in secular society is the belief “that human beings are created in the image and likeness of God”. “A secular society is one which recognises and upholds the distinction between Church and State and certainly the Catholic tradition and many other Christian traditions support this position,” he added. Archbishop Costelloe said the secular nature of Australian society has led Catholics to adopt the position which has been expressed by Pope Benedict then, and now Pope Francis. “We are Christians who believe in God, who believe in Jesus Christ and believe in God’s Church, we also believe in our values, our principles, and our teachings offer precious insight into God’s plan for creation and especially human beings. “So we maintain that it is our duty and our privilege, and in the context of many things going on today, we also want to say our rights to propose our values and convictions to the wider society in which we live, because we believe that they offer the best way forward to ensure the true flourishing of our society,” he continued. Archbishop Costelloe concluded his answers by reminding Christians of the primary challenge faced in this secular society using the words of St Paul in Romans 12:2. “Because we live in a secular society, and again more specifically in a secularised society, we find ourselves immersed in a culture which does not always accept or support, or even tolerate, the values by which we seek to live. “Unless we are careful, we may find ourselves unwittingly accepting the values of the society around us and beginning to make them the basis of our daily lives and decisions rather than making our belief in God and our desire to know God's will in the heart of everything,” Archbishop Costelloe explained. Perth Hebrew Congregations Chief Rabbi Daniel Lieberman. Photo: Amy Gibbs/UNDA. In his answer, Rabbi Lieberman took and interpreted the story of Abraham in the book of Genesis, emphasising that for people of faith to engage in a secular society is to understand the position of people of faith hold in society, set examples, and understand the impact that we have. “We are expected to be different as we are the children of Abraham and we have examples to bring. That example in which we are supposed to walk, enable us to navigate in this secularised world,” he said. Rabbi Lieberman concluded his response by saying people of faith need to stay true to their faiths and be a blessing to others regardless of their faith. Sheikh Muhammad Agherdien, Teacher at Langford Islamic College. Photo: Amy Gibbs/UNDA. Sheikh Agherdien responded by taking examples of great philosophers from the Catholic Church and Islamic faith, explaining how in the medieval period these philosophers looked at other religions to find answers. “What I want to point out is in the medieval time, how the synergy exists, how these philosophers engaged across cultures, religions and philosophies and in my opinion I think that is what needs to happen today,” Sheikh Agherdien said. 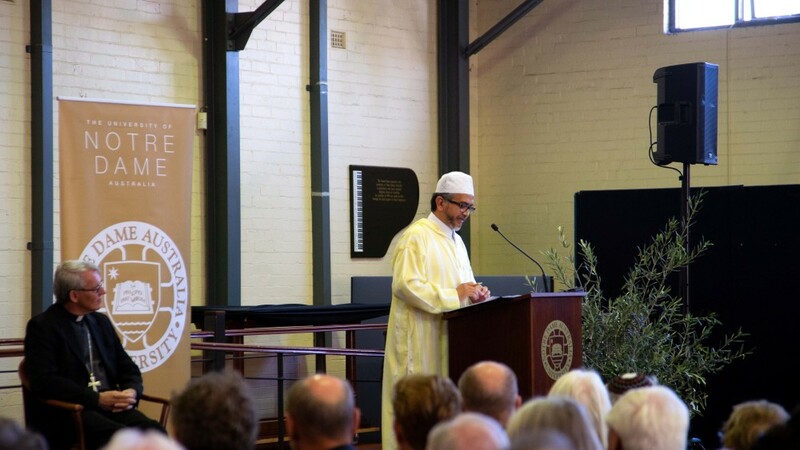 Sheikh Agherdien emphasised people of faiths need “to come together, sit together, discuss together, live with each other” in perfect harmony to face the challenge of secularity in Australian society. The event continued with a Q&A panel discussion, and one of the questions asked was whether the three faiths allowed euthanasia and the three leaders answered “no” cohesively, saying it is not permissible to take an innocent person’s life. The event concluded with readings and prayers from each faith.